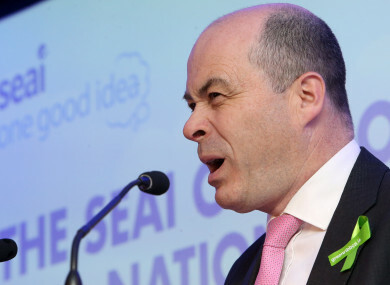 THE DEPARTMENT OF of Communications, Climate Action and Environment has identified more meetings that took place between former minister Denis Naughten and David McCourt. Naughten announced his resignation last week over revelations that he met with McCourt four times and also facilitated lunch for the businessman’s daughter in the Dáil. McCourt is leading Granahan McCourt, the last remaining consortium left bidding for the National Broadband Plan contract, worth up to €500 million. Last night, the Department revealed that two further meetings took place between the former minister and McCourt following a review of the minister’s diary meetings. A list of Naughten’s diary entries show how he met Naughten on 20 October 2016, although no minutes were taken, and 26 June this year. According to minutes of the 26 June meeting, McCourt said he was committed to investing in building high-speed broadband infrastructure in rural Ireland, and asked about the Department’s likely approach in the process. McCourt also outlined an expectation that the Minister and Department would speak directly on key issues that the consortium needed to address in order for the procurement to proceed to a conclusion. Four points about the bid – including the deadline, financing and decision-making processes, and the leadership of the consortium – were discussed at a dinner attended by McCourt and Naughten weeks later in New York. Earlier this week, the government announced that an independent consultant would review the procurement process surrounding the National Broadband Plan. The independent consultant, Peter Smyth, has been asked to submit his report to the Taoiseach and new Minister for Communications Richard Bruton within three weeks. Email “Diary trawl unearths more meetings between former Communications Minister and David McCourt”. Feedback on “Diary trawl unearths more meetings between former Communications Minister and David McCourt”.